BPD Ptl. Ian Courtney rescued the opossums and he and Ptl. Kristen Jeffers cared for them before turning them over to a rescue organization. 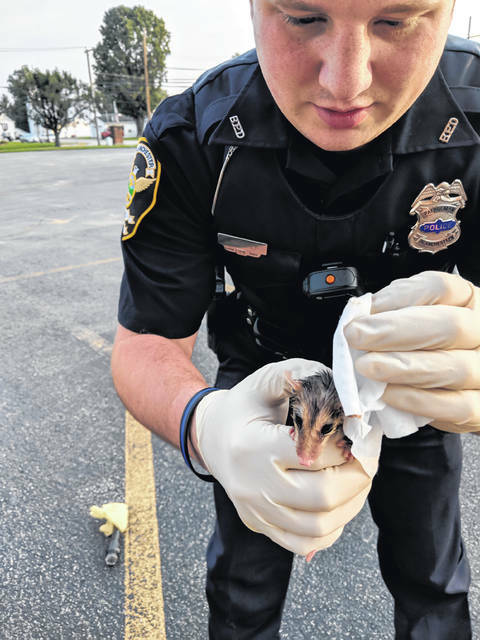 BLANCHESTER —Blanchester police made a rescue early Monday morning — of two newborn, orphaned opossums. Ptl. Ian Courtney found a dead opossum along State Route 123 near Maple Grove Avenue; nearby he found two newborn opossums, said BPD Chief Scott Reinbolt. Courtney, a midnight shift officer, “returned to the police station where he enlisted the assistance of day-shift Ptl. 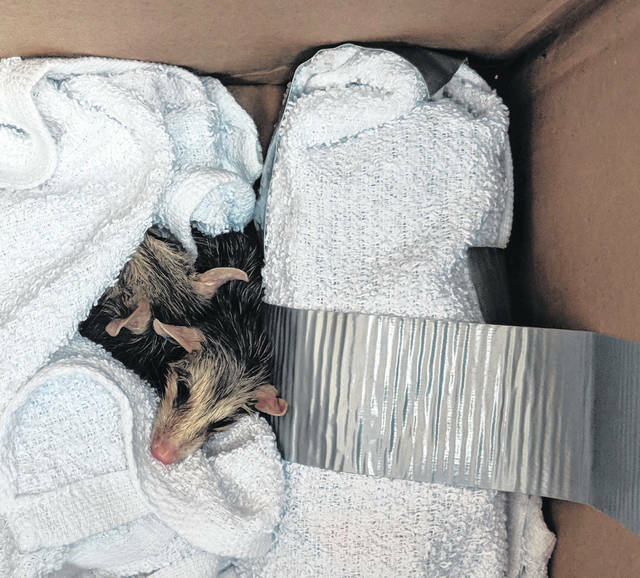 Kristen Jeffers, and they went and retrieved the baby ‘possums, cleaned them, placed them in a box with a hot water bottle, and began looking for a home for them,” said Reinbolt. Ptl. Jeffers spoke with a representative of Wild Again Animal Rescue in Xenia, who agreed to accept the animals if they could be delivered to Xenia. “Both Ptl. Courtney and Ptl. Jeffers displayed humanity above and beyond the call of duty in their intervention efforts, which I appreciate,” said Reinbolt. “Anyone wishing to help with the care of the animals can make a donation to the Rescue at www.wildagainrescue.com.